When the National Academy of Television Arts and Sciences rolls out the red carpet at Lincoln Center on September 22, VCCA Fellow and documentary filmmaker Ralph Arlyck will be there: his film "Following Sean" has been nominated for two Emmy Awards for Best Documentary and Outstanding Achievement in Writing. In this 87-minute film, Ralph returns to the subject of his 1969 film "Sean"—his 4-year-old neighbor who lives the hippie lifestyle in a Haight-Ashbury crash pad. Thirty years later, Ralph's camera finishes the story about the now grown-up Sean and his family. Be sure to tune into the awards ceremony next month! The National Endowment for the Arts has awarded a $15,000 grant to support month-long residencies for writers attending the VCCA for the first time. Applicants will be reviewed according to the established juried selection process. The next deadline is September 15, 2008 for residencies between February and May 2009. Somewhere on the application, or in a cover letter, please indicate that you are applying for an NEA-funded residency. A fully funded, month-long residency is valued at approximately $5,000. For more information, visit our website. The VCCA is grateful to the NEA for the support of our programs and for recognizing the importance of living artists to the health of the culture. Congratulations are in order for three-time VCCA Fellow Ysaye Barnwell, who performs with the internationally renowned a cappella quintet, Sweet Honey In The Rock. 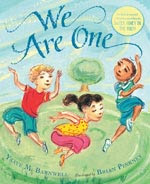 Her children's book and music CD, We Are One, a poetic tribute to community, togetherness, and diversity in the universal language of music, has received the Frances and Wesley Bock Book Award for Children's Literature. The award is given each year by the Library and the Neumann Institute for Franciscan Studies to acknowledge Franciscan values in children's books. Congratulations Ysaye! Visual artist Bradley Wester has just returned from a Fulbright trip to Japan where he spent the summer as a Senior Specialist Fulbright Fellowship Visiting Artist & Lecturer at Kyoto University of Art & Design. 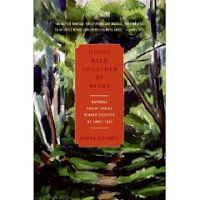 Says Bradley: "The Fulbright is to develop a body of work, the second body of work in a trilogy made in three distinct cultures using the ephemera from each culture as primary art material while immersed in that country's art and cultural history." The VCCA is pleased that Lila FentonHeasley has joined the staff as Development Coordinator. In her new position, Lila, who grew up in the Charlottesville area and feels very much at home back in the Blue Ridge Mountains, will support fundraising efforts and assist with special event planning. She spent the past year traveling the country with her new husband, Kurt. After considering New York and Los Angeles, they returned to Lynchburg, the “Hill City,” to be closer to family and friends. They were drawn to the city’s architectural revitalization and the vibrancy of the 5th Street, downtown area. Prior to coming to the VCCA, Lila worked as a production coordinator/associate producer at Concrete Pictures in Philadelphia. There she coordinated spots for the Food Network, PBS, CW, Military and Discovery Channels, associate produced music videos, and conceived, scripted and produced a demo for a music and travel series.